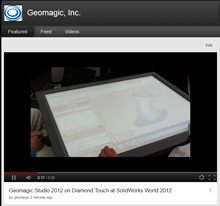 The Diamond Touch display, on show at SolidWorks World, intrigued us when we saw it. A spin-off from an MIT research effort, the display looks like a dining table with a big Windows screen on it. In its standard mode, the system allows a group of people to interactively work using hand and finger touch, to view data, mark up documents, work in 3D etc. spotting an opportunity for both learning and fun, we jumped at the chance to try out Geomagic Studio on it. Taking just a couple of minutes to load up a new driver onto his laptop, Geomagic Regional Manager, Eric Yeung, immediately fired up Geomagic Studio, and within minutes and with no enhancements or development, was immediately using the Diamond Touch display to zoom and pan data, decimate point cloud data, patch holes, and more. 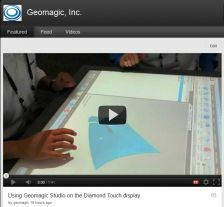 We have some video showing the display and the amazing speed used by Eric to do work in Geomagic Studio. The Diamond Touch is developed by Circle Twelve (http://www.circletwelve.com/) in Framingham, MA. President and CEO, Adam Bogue, described the lengthy process to develop the display to its current state, funded by ongoing sales of the units. The displays are available as 32 and 42 inch rectangular displays at this time. The company hopes to deliver the same display using LCD technology in th near future and ideally to build circular displays that more closely resemble a Conference table setting. Using Geomagic Studio on the display was fast, easy and fun. We hope to see more of these products in the future. 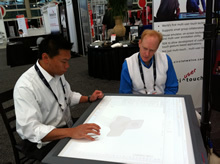 Click below to watch Eric in action with with Diamond Touch live from the floor at SolidWorks World 2012!